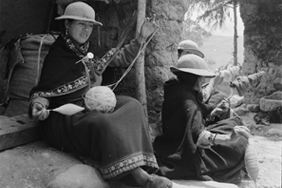 Women spinning wool. Juncal, Cañar, Ecuador. Photo by Niels Fock/Eva Krener, 1973. The National Endowment for the Humanities (NEH) has awarded a Documenting Endangered Languages Preservation Grant of $227,365 to Patience Epps and Susan Smythe Kung of the Archive of the Indigenous Languages of Latin America (AILLA) for support of their upcoming project entitled "Archiving Significant Collections of Endangered Languages: Two Multilingual Regions of Northwestern South America."